In this lecture Dr. Ruth B. Phillips focuses on the salvage anthropology paradigm, drawing primary examples from the work of University of Pennsylvania anthropologist Frank Speck and Edward Sapir in the early 20th century, and between the Museum of the American Indian, now NMAI, and the early National Museum of Canada (whose ethnology division was founded by Sapir, Speck’s fellow graduate student under Boas). Dr. Phillips rounds out her lecture by comparing the traditions in which they worked with contemporary Indigenous museology and the recent exhibition Anishinaabeg: Art and Power at the Royal Ontario Museum in Toronto. Phillips argues that the “knee-jerk” rejection of salvage anthropology is too simple both because of its retroactive historical judgments and the uses being made of the collections it generated by contemporary Indigenous curators. At the same time, Dr. Phillips argues that emerging Indigenous museology is moving us toward an important paradigm shift. Dr. Ruth B. Phillips received her doctorate in African art history from the School of Oriental and African Art at the University of London in 1979, and wrote her dissertation on the masquerades performed by Mende women in Sierra Leone. As a post-doctoral fellow she extended her research to the indigenous arts of North America. Phillips began teaching at Carleton in 1979. She is co-author, with Janet Catherine Berlo of the widely used survey text Native North American Art, for the Oxford history of art (revised ed. 2013). Her 1997 book Trading Identities: The Souvenir in Native North American Art from the Northeast, 1700-1900, argued for the authenticity of historical arts made for the curio and souvenir markets and explored the creative innovations and cross-cultural exchanges they embody. Museum Pieces: Toward the Indigenization of Canadian Museums (2011) traces the epochal changes in representation and practices following the contestations and postcolonial critiques of the 1980s and 90s and was nominated for the Donner Prize in Public Policy. In 1997 Dr. Phillips was appointed Director of the University of British Columbia Museum of Anthropology in Vancouver where she, museum staff, and three First Nations partner communities developed an innovative plan for renewal and expansion that resulted in a successful application to the Canada Foundation for Innovation, the British Columbia Knowledge Foundation, and UBC for a $41 million grant. In 2003 Dr. Phillips returned to Carleton as a Canada Research Chair in Modern Culture. She co-founded GRASAC, the Great Lakes Research Alliance for the Study of Aboriginal Arts and Cultures. The GRASAC Knowledge Sharing Database, created with funds from the Canada Foundation for Innovation, SSHRC, and Carleton, creates digital access for Indigenous community members, academics and museums to heritage held in repositories around the world. It provides a platform for the co-creation of new, multi-vocal and interdisciplinary research and was awarded the 2010 Premier’s Discovery Award in the Humanities by the Province of Ontario. In 2015 she was awarded the Lifetime Achievement Award of the American Anthropological Association’s Council for Museum Anthropology. 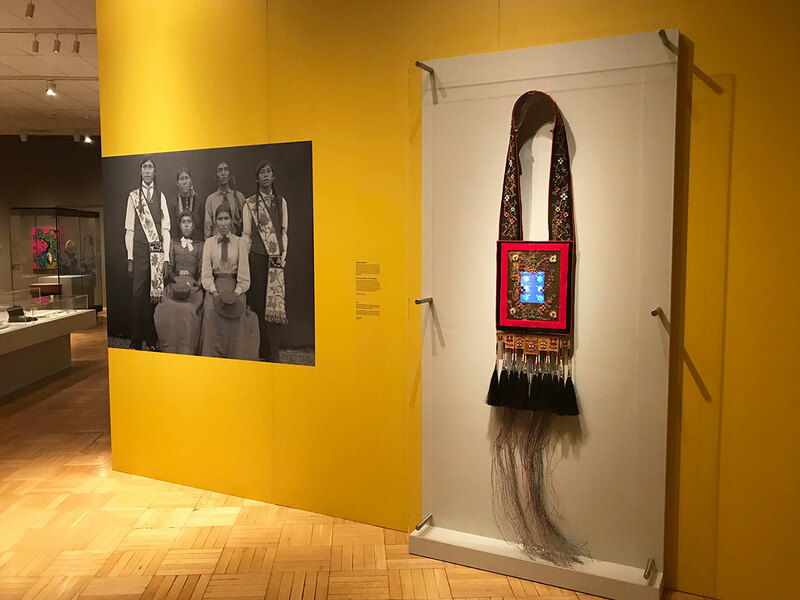 Image credit: Installation view from “Anishinaabeg: Art and Power,” Royal Ontario Museum, 2017, with a work by Barry Ace in the foreground titled Digital Bandolier (2012) Velvet fabric, brass, electronic components, horsehair, wire, beads, cotton thread, cotton fabric, plastic and video screen. 238 (h) x 38 (w) x 8 (d) (cm), Collection of the City of Ottawa. Photo courtesy of the Artist.